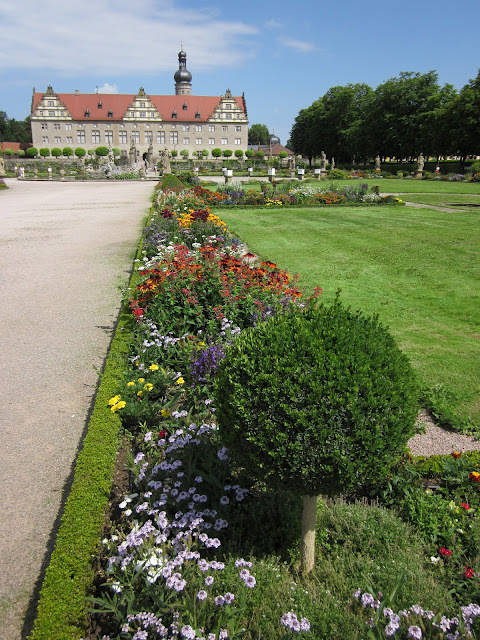 Just about everywhere you go in Germany you are likely to discover an unfamiliar castle, palace or fortress with lovely gardens or grounds beckoning you to stop for a stroll or a picnic. Weikersheim Castle in the town of Weikersheim, in the Baden-Württemberg region, is one of those idyllic castles. The peaceful baroque gardens are dotted with tall stone sculptures and offer a view of the valley. The interior of the castle is rich in art and baroque decor, with a famously well-preserved knights' banquet hall particularly worth seeing. Guided tours of the palace take place every hour and tickets are 5.50€ for adults, 2.80€ for children under 15, and 13.80€ for a family ticket. Today the castle is home to the Jeunesses Musicales Germany during the summer and this August, 2012, will host a two-week chamber music festival featuring the California Institute of Music. I've never heard of this castle before but when I see the name typed out, I automatically think Weimarainer, like the dog! I love Germany. We are headed back this summer and can't wait. What a beautiful castle - the grounds look stunning! I'm going to have to plan a trip to Germany soon - my daughters would love all these gorgeous castles! I never been in Germany, neither have heard about this castle earlier, But is is great building of old times.would love to visit it. These look really great, I'm sure that I'll be taking photos as well when I go there really soon.